When I bought my first DSLR three years ago, I had no clue about the composition, photography technique, lighting and many other things. I just bought a DSLR camera because I had interest in photography and enjoyed taking pictures. I still remember a shot of a deer that I took from the back and was very happy with the result. It had shallow depth of field, well focused and good light. I couldn't find anything wrong with my picture and thought to share with my photography community. Guess what? My composition was completely wrong which I realized after fellow photographers commented about it. And you probably have already guessed what went wrong on my picture. Yes, I took the shot from the back of an animal and viewers couldn't connect to that photograph very well. I started learning from my mistakes and today, I thought I would write something about what I learned so far so that you don't have to go through same mistakes and waste your time. But instead, you can use that time for taking creative shots. When shooting animals, there are few important camera settings and the composition ideas which you may want to follow to get better results and connect well to the viewers. Let me explain them briefly in points. 1. When shooting birds or animals, you may want to use the spot metering so that the camera meters exposure based on the focus point. 2. Use Continuous-servo (AF-C) Autofocus mode with the single point AF or the Dynamic Area AF Autofocus point. When you in AF-C mode, after you press the shutter release button, camera focuses your subject wherever you select the focus point and continues to monitor the subject to refocus if the subject moves along and the single point focusing method helps you to focus on particular area, an eye for example. Using the Dynamic Area AF helps you to track the moving subject if it goes out of focus in the frame. If you are shooting flying birds or fast moving animals, you may want to use the Dynamic AF points. 3. Use the widest aperture (smallest f number) possible so that you will get the faster shutter speed to freeze the motion of moving subjects. 4. While shooting animals, try to focus on eye as much as possible because it naturally draws the viewer’s attention to the photograph immediately. Here are few photographs I took recently and hope you will like it. 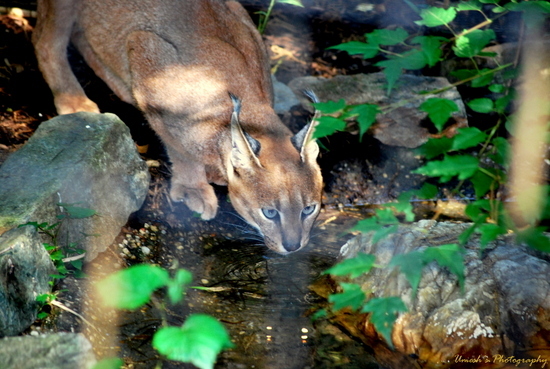 This shot was taken at the National Zoo, Washington DC and I liked how this cat is cautiously look at me while drinking water. Learning from the mistake is the best way to learn. You will never forget what you learned and sharing those ideas with others help you grow even bigger and faster. What Feature Do You Assign To The Function Button? Deepak (Mumbai, India) asked : What camera feature do you prefer to be assigned to the function button on a DSLR camera? Deepak, to be honest with you, your question forced me to go back and see what are the other options available in the menu to assign to the function button. I always assigned only two of my favorite options and never looked back into other options. 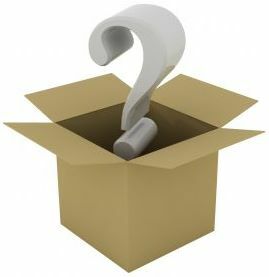 In the first part let me talk briefly about what is the function button and why should we use it? And in the second part I will explain what feature do I assign to the function button and why? Function button allows you to change the particular camera setting without going deep down to the menu options. Once you assign the function button to the specific feature, whenever you press the function button, camera will adjust the setting for that particular shot. This feature comes very handy when you want to quickly alter the camera setting without wasting too much time navigating through the menu tree. Now let’s discuss how to assign one of the camera’s feature to the function button. In this example, I am taking Nikon D90 to refer to the menu items. If you use some other DSLR, your menu navigation might be little different. Step 2 : Go the Custom Settings Menu (pencil icon) and navigate down to f (controls). Step 3 : Select f3 (Assign FUNC. button). You have varieties of options available there such as spot metering, +RAW, matrix metering, center-weighted metering, flash off, framing grid, AF-area mode etc. Personally, my favorites are spot metering and +RAW mode. Why? Because I set the metering mode to the matrix metering by default and sometimes if I want to give the credit to the center of the subject for the metering purpose, I want to use the spot metering. When I am ready to shoot, I would then press the Fn button and the camera will use the spot metering for that particular shot and go back to the regular setting as soon as the picture is taken. And the same is true for choosing the +RAW mode as well. When I was beginning to learn the basics of photography, I always shot in JPEG Fine mode but once in a while I also took the RAW images to edit the picture later on the computer and learn more about the post-processing tools and techniques. So, whenever I wanted to take the RAW image, I pressed the function button and shoot with JPEG Fine+RAW mode for the particular shot so that the camera takes JPEG and RAW versions of the image and stores them into the memory. You can play around with the options your camera has and decide which one you want to stick with for regular use. Thank you again for your question from which I also got chance to learn about other options my camera has. Happy shooting! What Is The Best Post-Processing Software For Photos? Today's most of the consumer level DSLRs have dedicated scene modes like close-up, portrait, sports etc which sets exposure automatically when you dial into the mode. Besides these pre-programmed modes, it also comes with few other exposure modes (A, S, P and M) to allow you control over camera’s default settings. When you dial into those pre-configured mode, portrait mode for example, you really do not have a control over exposure. If you want to manually set the exposure, you have to use one of the four modes (Aperture Priority, Shutter Priority, Program Mode and Manual Exposure) available in your camera. Out of these four modes, three of them are semi-automated modes and one is fully manual mode. When you want to change from one mode into another, you would have to rotate the Mode Dial and select the mode you want to change into. These settings are not specific to any particular camera model but different companies may use different alphabets to denote these modes. For example, Nikon’s shutter priority mode is denoted by letter S whereas Canon’s is T but the idea behind it’s functionality is the same. But in this blog, I will be taking Nikon DSLR as a reference camera when I explain these different modes. Now, let’s get into our first exposure mode which is an Aperture Priority (A) exposure mode. In an Aperture Priority (A) mode, you set the lens’ aperture value or give priority to the aperture value and your camera sets the shutter speed to control the overall exposure of the image. This mode is probably best when you want to control the opening or the closing of your lens to gain shallow or deep depth of field. You would have to use the smaller F-stop (f/stop) value to get the shallower depth of field (famous for portrait or close up shots) and you might want to use the larger f/stop value to get everything in focus (widely used in landscape photography). This mode is best if you want to lock the aperture at fixed value and want your camera to set the shutter speed according to the aperture value you set. If your current aperture value and the shutter speed doesn't match to give you optimal exposure for the subject, you will get Lo or HI indicator in the camera viewfinder telling you that subject is too dark or too bright resulting into underexposed or overexposed photograph. If you get the indicator on, you might want to consider adjusting your settings. Our second exposure mode is the Shutter Priority (S) mode which is just an opposite of the Aperture Priority mode. In this mode, you set the shutter speed and your camera will adjust the aperture value for the corresponding shutter speed to give you the balanced exposure. You might want to use this mode when you want to shoot fast moving subjects to freeze the motion (shooting sports events for example). This mode is also famous for landscape photography specially if your frame contains moving subjects like water falls or vehicles where you can control the speed of shutter to produce long exposure effects. Third exposure mode is the Program Mode (P) which is almost like an Auto mode but it will let you override some of the settings on the camera. Nikon uses sophisticated algorithm to determine the best exposure by using the combination of aperture and shutter speed. The algorithm takes the present lighting conditions and other variables into account and program the camera setting to the best of it’s ability. When you frame your photograph and the correct exposure can't be achieved using pre-set value, Lo or Hi indicator in the camera viewfinder warns you about the underexposed or overexposed image. If you get the warning, you can adjust ISO setting to change the light sensitivity and see if that makes any difference. Unlike Auto mode, Program mode allows you to change the camera parameters such as Exposure Compensation, Metering, ISO, White Balance etc. If you want to change the shutter speed and the aperture value, use the main command dial (also called rear command dial) and it will give you the different combinations of aperture value and shutter speed with the same exposure. When you do that, the letter P (for the Program Mode) changes into (P*) into LCD screen which Nikon calls the "Flexible Program". If you want to go back to the default settings of P mode, you just have to rotate the command dial to the left or the right until P* changes into P.
Our fourth and final exposure type is Manual Exposure (M) mode. If you want the complete control of your camera, Manual Exposure mode is what you need to dial into. Most of the experience photographers and the professionals use this mode very often because they know how their camera metering system is going to react under certain shooting environment. In the Manual Exposure mode, you can set the shutter speed and the aperture value in whichever combination you like. 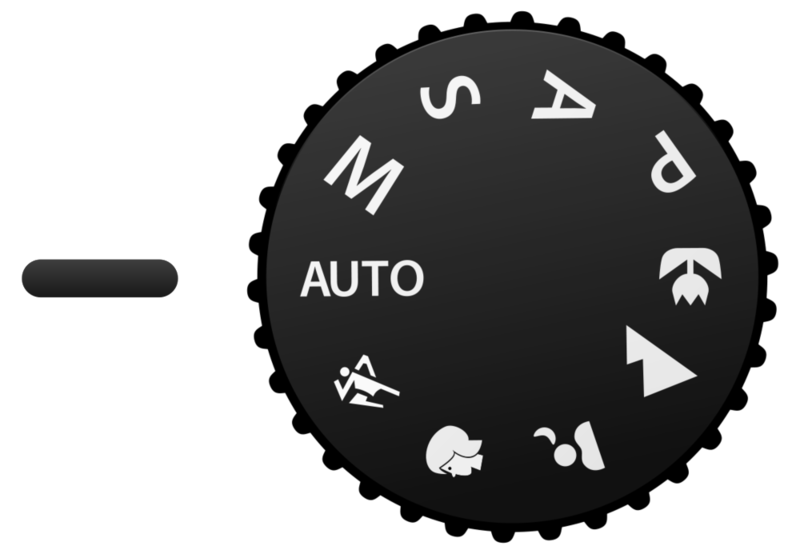 When you are in Manual mode, rotate the main command dial to change the shutter speed and the sub-command dial (also called front command dial) to change the aperture value. In this mode, you can set everything manually including ISO, White Balance, File Type etc. Personally, my favorite for the landscape or the cityscape photography is an Aperture Priority (A) mode where I can set the lens aperture to certain value and let the camera decide the shutter speed. If the lighting situation is tricky, I use the Manual mode and control both the Aperture value and the Shutter speed individually. In photography, Metering is the method to calculate the optimal exposure for the subject on the basis of information that the camera gets from the varieties of available light sources. Back in old days, photographers used to rely on an external light metering device because cameras were not equipped with the metering sensor that can measure the sensitivity of the light and give you the information about the exposure settings. But today, every modern DSLR camera comes with the sensor that meters the light entering the camera sensor through the lens and determines the correct exposure settings. Even though some DSLR brands use different naming convention for the metering mode, overall idea of the metering is the same. In this article, I will be taking a reference of Nikon D90 to explain different metering modes but the technique implies to all DSLR brands and models. What is the Metering mode? Metering mode is a different exposure mode available in modern DSLR cameras, which is responsible to deal with the light sources and calculate the optimal exposure for the subject and the overall image. When you frame the scene, the metering mode determines the intensity of the light coming from the scene into the sensor and gives that information to the metering system. If you are shooting in auto exposure mode or one of the semi-auto; A, S or P exposure mode, your camera will try to set the correct exposure automatically by calculating the correct combination of the ISO, shutter speed and the aperture value (F-stop). But, if you are shooting in manual (M) mode, you would take the reading from the camera metering system as a reference whether it is negative (underexposed) or positive (overexposed) and set the exposure values (Aperture, Shutter speed and ISO) manually. When you point the camera towards the scene and if the scene is too bright, the bar (shown inside the red box in the picture below) moves towards the positive side suggesting you to increase the shutter speed or reduce the aperture size by increasing the aperture value to properly expose the scene. And, if the bar moves towards the negative side, it means the image is underexposed and you would need to decrease the shutter speed or open up the aperture by reducing the aperture value. Nikon viewfinder where the metering sensitivity is represented by the scale bar shown in the red rectangle box. Most of the time camera metering system does a good job of sensing the light and calculate the correct exposure, but sometimes, it gets deceived by the light source when there is a mixture of dark and bright light sources. The common examples where the metering system might not give you the best exposure calculation might be a sunset with a darker sky and a bright horizon, or a subject under a very bright sunlight etc. Now, lets talk about the different types of the Metering modes available in modern DSLRs. 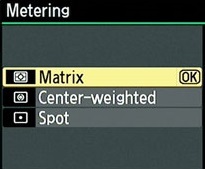 Nikon DSLRs use different Matrix metering depending on the type of the lens you are using. Nikon D90 uses 3D color matrix metering II with the type G, or D lenses and color matrix metering II (which doesn’t include 3D distance information) with other types of CPU lenses, which is the default setting for the D90. 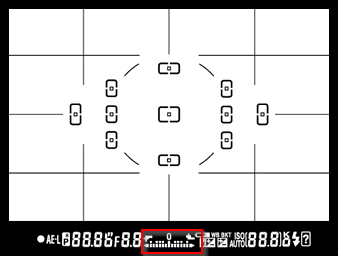 When you look at the LCD screen on the top of the camera body (on the right side where the shutter release button is), the Matrix metering mode is indicated by the black rectangle shape with the dot in the middle. While metering the scene using the Matrix metering mode, camera divides the entire frame into multiple zones and calculate the exposure based on the colors of the light, distance to the subject (if G, or D lenses were used), color tones etc. Camera collects the information from all the zones but gives the priority to that area where the focus point is on. Matrix metering mode does a pretty good job most of the time and should be used for a day to day photography. Center-Weighted metering mode is represented by the little circle with a central dot inside. Like in the Matrix metering mode, it also calculates the exposure from the entire frame but the center area is given more priority (weight) during the calculation. According to the Nikon, it gives 75% of the weight to the center circle whose diameter can be set to 6, 8, or 10-mm in Center-Weighted area from the Custom Settings Menu. As name suggests, Center-Weighted metering mode doesn't rely on your focused area but gives the priority to the center of the frame instead. It is not recommended setting for most of the time and also considered as a least accurate metering method to use because the subject might not be in the center of the frame all the time. It should only be used when you want to emphasize the center of the frame, in portrait shooting for example. Spot metering mode is indicated by the little circular dot. Unlike other two methods, while metering the light, spot metering only gives the priority to a small area where the current focus point is and ignores everything else inside the frame. According to the Nikon, it meters 3.5mm circle (about 2% of the frame) centered on the active focus area. It is widely used when you would want to give the proper exposure to the focused area no matter how the surrounding would be. How to change the Metering mode? It depends on the camera brand and the model, but in case of Nikon D90, there is a dedicated button left to the shutter release button. While the button is being pressed, if you rotate the rear command dial (also known as the main command dial), camera switches the metering mode from one to another. If your camera doesn’t have a dedicated button for the metering, you can go inside the Metering/Exposure menu and adjust the metering mode.